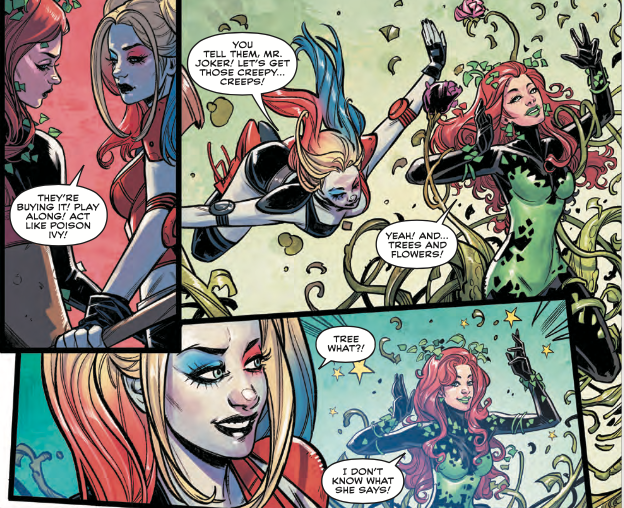 Harley & Ivy Meet Betty & Veronica #4 Review – AiPT! What happens when Gotham’s two most villainous vixens switch bodies with Riverdale’s two IT girls? Spoiler alert: hilarity and mayhem ensue and neither town or city may ever be the same again. Harley & Ivy Meet Betty & Veronica #4 starts us right out with Betty and Veronica on the streets of Gotham as Harley Quinn and Poison Ivy. Their bodies were swapped out with the villainesses the night before by a spell cast upon them by Zatanna and Sabrina at Hiram Lodge’s benefit gala. Now they are being confronted by a group of thugs out to make them pay for the money that Harley and Ivy owe to their boss. The Joker shows up and scares them off, only it’s not the Joker, it is in fact Reggie Mantle. Reggie is delusional and thinks that he is the Joker. Veronica tries to use Ivy’s powers of seduction and mind control on Reggie to convince him that he is not the Joker to no avail. She also tries to use her newly inherited powers to conceal them from the police and is partially successful. The girls quickly realize that they need to find a way to blend in better, or else they risk being fingered by the police or being confronted by thugs mistaking them for Poison Ivy and Harley Quinn again. They find a boutique on the street and head inside where Veronica tries to use her credit card numbers to purchase some new clothes. Unfortunately the shop owner knows Veronica well and when he sees her looking like Poison Ivy, he has his security grab them and detain them as the police are called. The girls fight off the security and escape, stealing a taco truck as a getaway vehicle. Meanwhile back in Riverdale Harley and Ivy are doing their best to adjust to teenage high school life. They continue with Ivy’s plan to thwart the construction and save the swamp and all of its rare plant life from being leveled and made into a campus for the students of Riverdale. Things seem to be going along relatively smooth until they are confronted by Cheryl Blossom. Cheryl is upset and very angry that she and her brother Jason were snubbed and not invited to Veronica’s father’s party. Jason steps in, apologizes for the actions of his sister, and invites Harley and Ivy out to a drive-in movie, Tree People II: Bark and Bite, along with Archie as a peace offering. Unbeknownst to our “heroes”, this is just a ploy by Cheryl and Jason to exact revenge upon Betty and Veronica. Ivy also has a hidden agenda for going to the movie, as the drive-in is very close to the construction site. She reveals her plan to Harley for the two of them to leave halfway through the film, sneak over to the construction site and destroy all the construction equipment (and returning back to the drive-in before anyone realizes that they were gone). As they make their way over to the swamp, Cheryl jumps out at them disguised as one of the Tree People from the movie. She sprays them with maple syrup and records the entire incident on her cell phone. Harley and Ivy realize that not only has she recorded them being “sapped”, but Cheryl has also recorded the two of them sabotaging the construction equipment. They chase Cheryl down destroying her phone and the evidence on it. Ivy then reveals to Cheryl that she has foolishly used poison ivy leaves to make her tree person costume, rubbing it in her face literally. Harley and Ivy return home feeling somewhat defeated by a teenage girl and Ivy comes to the realization that not only has she lost her powers, she is no longer immune to the effects of poison ivy. Oh the delicious irony. The issue ends with all four girls agreeing on one thing. They want their bodies back! Paul Dini and Marc Andreyko do a great job on the writing for this title. They manage to merge these two franchises into one world in a way that is fun, outrageous, and hilarious. This particular issue really picks things up story-wise and it’s definitely the funniest issue so far in this DC/Archie Comics crossover. The whole body swap thing has been done before and feels a little bit cliche but it works well. It is very funny to see Betty and Veronica let loose on the streets of Gotham as criminals. Reggie thinking that he is the Joker does serve a minor purpose but really doesn’t add to the story much however. The artwork on the series continues to be one of the strongest parts. Laura Braga does a wonderful job capturing the action in the situations as well as the comedy of what is going on. Anif Prianto’s colorings really add a beautifully vibrant element to the whole thing. This is a very fun title with a very fun look. Overall, Harley & Ivy Meet Betty & Veronica #4 is an entertaining issue that really moves the story of this mashup along hysterically. It is well written and the pairing of these two franchises feels organic and works brilliantly. I would recommend this title to fans of both DC and Archie Comics alike. If you’re looking for a fun, beautiful looking title that will give you a chuckle then this book may just be the title for you. 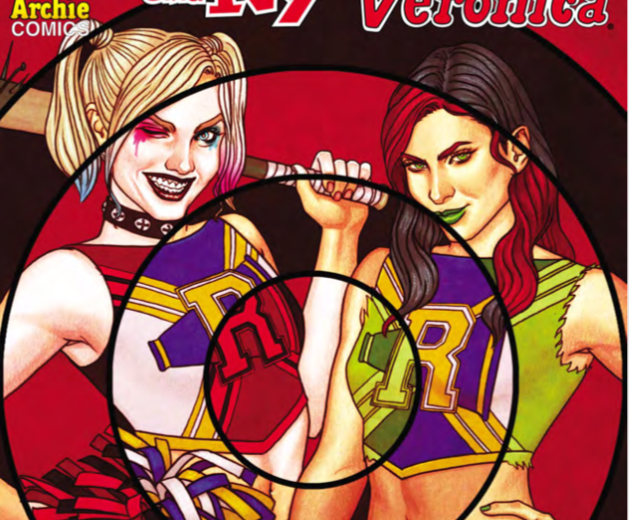 Harley and Ivy meet Betty and Veronica #4 is a funny issue that really brings this DC / Archie Comics crossover to whole new levels of hilarity. Reggie thinking that he is the Joker seems a bit throw away and really doesn't add much to the story. Although it does work very well in the context of the plot, the body swap storyline has been done to death.